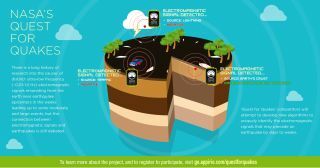 NASA's "Quest for Quakes" algorithm challenge is offering $25,000 for the best software that can search through data archives for signs of electromagnetic pulses that may precede earthquakes. NASA needs your help to bolster current earthquake detection technologies, and they’re offering $25,000 to the team that develops the best way to detect an oncoming quake. The space agency calls its challenge the "Quest for Quakes," and seeks to inspire new software codes and algorithms to identify electromagnetic pulses (EMP) that scientists theorize precede an earthquake. According to one theory, fracturing in the Earth's crust creates a pulse of electrical charge that travels through the earth and shows up as a small change in the magnetic field. The difficulty, however, is separating quake-specific EMPs from natural and man-made electromagnetic noise like lightning, trains, traffic, and solar storms. “Developing a reliable approach that can separate potential earthquake-induced electromagnetic pulses from the myriad of natural and anthropogenic sources has been a significant challenge," Craig Dobson, program scientist at NASA Headquarters in Washington, said in a statement. "We look forward to seeing the innovative ideas from this competition and learning more about this controversial phenomenon." NASA hopes Quest for Quakes participants can discover a way to distinguish EMPs that indicate earthquake from other, non-quake electromagnetic pulses. They’ve given contestants electromagnetic signal data collected over three-month periods from multiple sensors near past earthquakes. Data with no earthquakes has also been included to act as a control. Data for the competition comes from the more than 65 terabytes of data collected from 125 sensors in California and 40 international sensors monitored by the QuakeFinder group, a humanitarian research and development project by Stellar Solutions, Inc., Palo Alto, California. For more information or to register visit: http://go.appirio.com/questforquakes. Follow Kasandra Brabaw on twitter at @KassieBrabaw. Follow us @Spacedotcom, Facebook and Google+. Original article on Space.com.